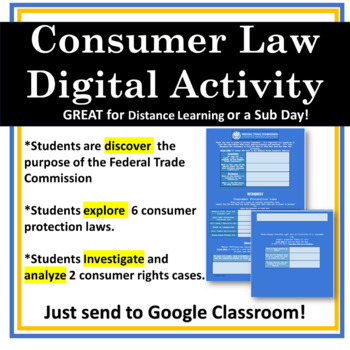 This NO PREP HyperDoc is an excellent resource for students to DISCOVER, INVESTIGATE, AND DIG DEEPER in consumer laws and the learn of the ways that the Federal Trade Commission protects consumers. GREAT resource for a business law class, entrepreneurship class, OR marketing class! They also investigate TWO recent cases of consumer violation. GREAT way to teach your students what companies must do to be fair to consumers AND they learn what THEIR rights are as a consumer!